The Bible and Torah have long been used at swearing-in ceremonies for members of Congress and have been joined by the Quran in more recent years, but this week marked the first time the Bhagavad Gita was used. Hawaii Rep. Tulsi Gabbard, the first Hindu to join either chamber of Congress, used the sacred text from her faith in a ceremonial swearing-in conducted by Speaker of the House John Boehner (R-Ohio). "I chose to take the oath of office with my personal copy of the Bhagavad-Gita because its teachings have inspired me to strive to be a servant-leader, dedicating my life in the service of others and to my country," said Gabbard, who served in the Iraq War, after the swearing-in. "My Gita has been a tremendous source of inner peace and strength through many tough challenges in life, including being in the midst of death and turmoil while serving our country in the Middle East." While no religious ceremony is legally required for those elected to Congress and the Senate, many choose to take oaths of office over Christian and Jewish texts, and Minnesota Rep. Keith Ellison, a Muslim, took his oath over a Quran. But Gabbard's choice of text is symbolic of growing religious diversity of Congress. 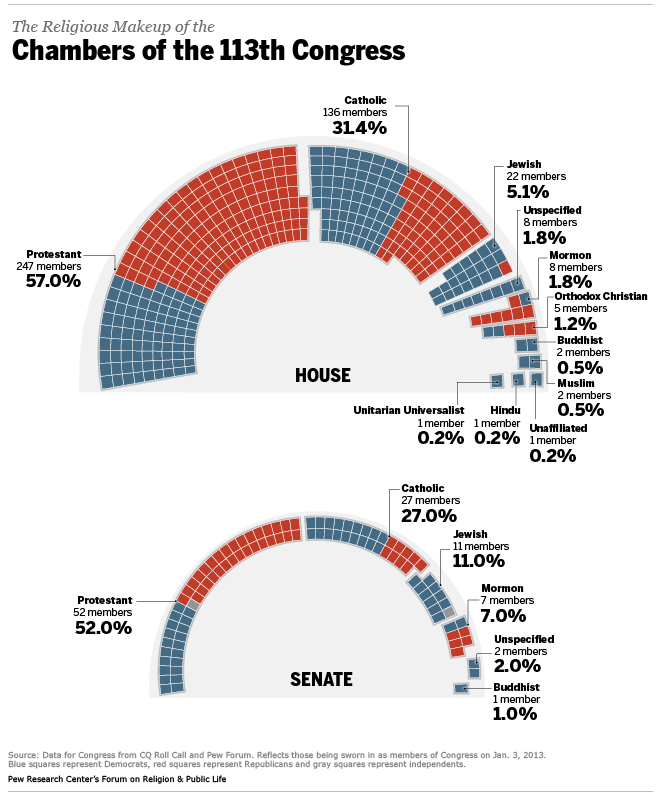 A new Pew forum analysis of faiths of those in Congress released Thursday shows that while Congress is mainly Protestant and doesn't exactly mirror the nation's religious diversity, recent elections have brought it to gradually increase its share of non-Protestant members. The analysis found that Congress trails in its share of the one in five Americans who claim no religion. Gabbard, 31, was born in American Samoa, and raised by a Catholic father and a Hindu mother. She moved to Hawaii when she was 2 and joined the Hawaii Legislature in 2002 at age 21. She served in the Hawaii National Guard the next year and, in 2004, went to Baghdad to be a medical operations specialist. In 2008, she was deployed to Kuwait to work with the nation's counterterrorism trainees. Gabbard chose to embrace the Hindu faith after her mother started practicing it when Gabbard was a teen. The congresswoman-elect, whose first name refers to a tree that's sacred to Hindus, follows the Vaishnava branch of Hinduism, which focuses on the Supreme Lord Vishnu and his 10 main incarnations. Largely made up of Indian-Americans, the Hindu population in the United States is between 600,000 and 2.3 million. Unlike most Hindus, Gabbard is not of Indian heritage. Her father is Samoan and her mother is a convert to Hinduism. During her swearing-in using the same Gita Gabbard kept while in Iraq, she reflected on her diverse upbringing and the role it played in her faith. "I was raised in a multiracial, multicultural, multi-faith family. My mother is Hindu; my father is a Catholic lector in his church who also practices mantra meditation. I began to grapple with questions of spirituality as a teenager," Gabbard said. "Over time, I came to believe that, at its essence, religion gives us a deeper purpose in life than just living for ourselves. Since I was a teenager, I embraced this spiritual journey through the teachings of the Bhagavad Gita." "In so doing, have been blessed with the motivation and strength to dedicate my life in service others in a variety of ways," she said. Gabbard takes the seat of Sen. Mazie Hirono, a former Hawaii representative who is the first Buddhist in the Senate.